While planning Chesney’s Underwater themed birthday party I was trying to find a fun DIY craft that fit the theme, didn’t cost a fortune, and doubled as a party favor. I’m so sick of goodie bags filled with candy! I’d rather invest that money in something of actual value and make fun activities for kids. I’ve used affiliate links to the products I used. While exploring different options on Etsy—I freaking love Etsy—I stumbled across these adorable little creatures called Marimos. The owner of Wendiland, answered all of my questions and assured me that Marimos are extremely low maintenance and make great desk pets. They simply need to have distilled water (changed once every 1-2 weeks,) no direct sunlight and a bit of movement. The Marimo is basically an algae ball. Taking good care of a Marimo is considered very good luck. They can be found swishing around in Japanese fresh water lakes. They are extremely slow growing and the largest one on record is about the size of a soft ball and thought to be about 200 years old! 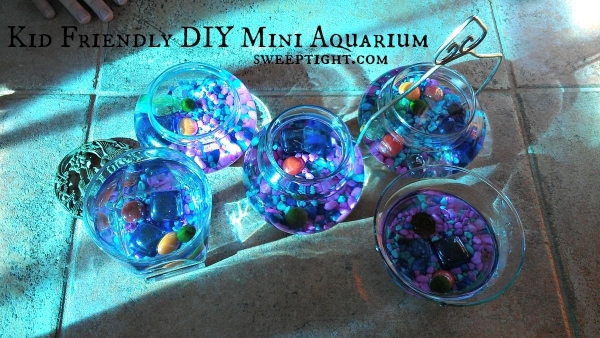 Each of Chesney’s friends got to create their own DIY Mini Aquarium at her underwater themed party and take it home. At first, their parents looked at me like I was crazy for sending their kids home with a new pet but once they realized it’s virtually self-sufficient and cost free, they loved the idea. Distilled water I grabbed a couple gallons and only used about half of one for this project. Aquarium rocks I bought a couple different colors so the girls had options when decorating their mini aquariums. Decorative glass stones Marbles, small mosaic glass pieces or any pretty and smooth glass will do. Just make sure it’s polished so no one gets hurt while handling it and boil it before adding to your Marimo’s home. Seashells are also an option. Whatever you use, just make sure you put it in boiling water first to disinfect. After cleaning all our supplies in boiling water, I set up the table and let the girls assemble their mini aquariums. Simply let them pick their preferred colors and then layer the supplies in the glass container in the following order: aquarium rocks first, decorative glass stones or seashells next, then slowly pour the distilled water against the glass so it doesn’t disturb your rock arrangement. 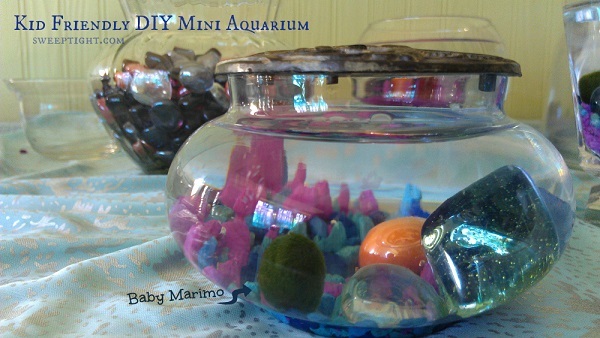 Your mini aquarium is then ready for the baby Marimo! Make sure the kids know that this is actually a living thing and deserves care and respect just like any other pet. We even named all our Marimos! All they need is a nice place in your home or on your desk away from direct sunlight. Don’t forget to change their water once every couple weeks, or if you notice it getting cloudy, using only distilled water. And, every now and then pick up or swirl your Marimo around so that the water can move through and circulate through it. After all, the happier your Marimo, the better your luck will be! What are your favorite fun activities for kids? How neat these Baby Marimos are! I have never heard of them. 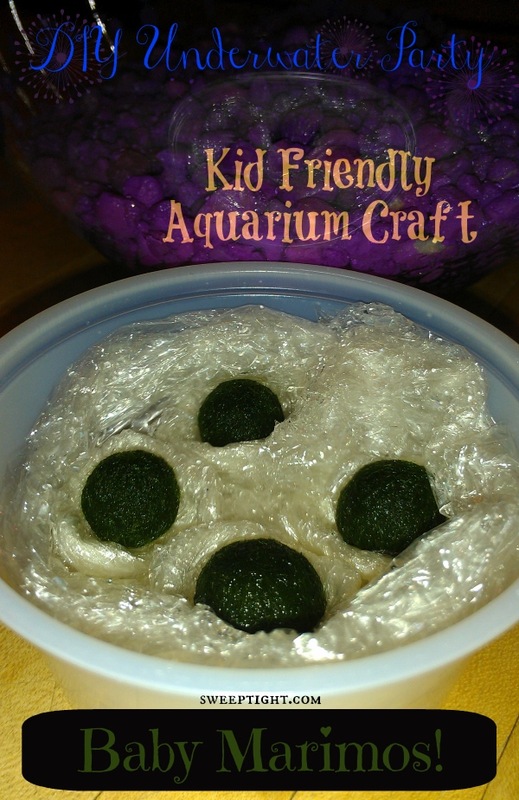 I used to have an aquarium when my son was little and we had fun with the fish he had in them. 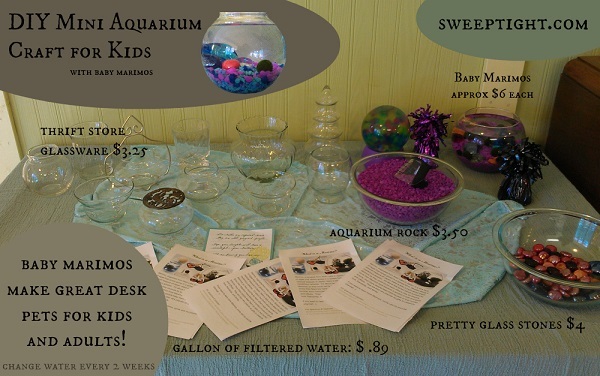 I like this cute aquarium and I need to to get my nephew to have one. Clever idea for a birthday party gift, love it! I’ll bet those girls won’t soon forget it either, I know I wouldn’t!